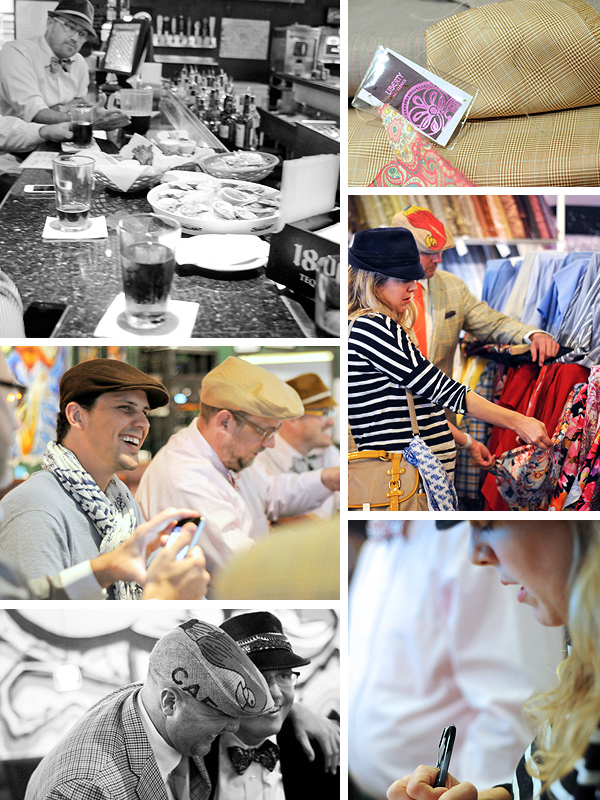 Tag along as milliner Cassie MacGregor takes her top male clients on a fabric-buying field trip to Plano. There will be blood. And paisley. Brian Davis is a self-deprecating, dapper gent. “Not many men can pull off a velvet tuxedo jacket in Plano on a Saturday morning,” the real estate agent laughs as he fingers through bolts of fabric, searching for a bit of sartorial inspiration. Finally, one particular pattern intrigues him: black with a flowy magenta, cyan, and yellow floral print. It might generously be described as Pucci-esque. Davis hesitantly cradles it, unsure of what he’s found, and looks about for an opinion. Fellow hat aficionado Rob Shearer and local milliner Cassie MacGregor approach. MacGregor touches the fabric, wrinkles her nose in disapproval, and Davis puts the bolt down, heading off toward the next pile of textiles, all the while flirting with the dejected fabric from the corner of his eye. This relationship is far from over. MacGregor then turns her attention to the other five men she has shuttled to Fabrique—a favorite fabric store of hers located on the southern edge of Plano—on this crisp Saturday morning. MacGregor, who owns House of MacGregor, is one of Dallas’ top hatmakers. Trained in millinery at New York’s Fashion Institute of Technology, her work has appeared in magazines such as W and Vogue Italia. MacGregor’s studio is located above the popular restaurant Bolsa in the Bishop Arts District and has become a favorite with men who have a taste for one-of-a-kind chapeaus. Each hat is custom made. MacGregor works with clients on fit and personal style. The inaugural fabric trip to Fabrique—in November 2010—seemed like a natural extension of this highly personal service. “At the time I was dating Rob [Shearer, a client whom she has since married] and thought it would be fun for him to pick out his own fabric,” MacGregor says. As she was planning the trip, she realized that she had other male customers who might enjoy the fabric field trip. Upon arrival, the vodka-fueled crew bursts into the store like a school of natty sharks, the finlike tops of their black wool newsboys and gold felt fedoras darting through the sea of fabric. A chorus of questions rises from the store: “Cass, could you make a pocket square out of this?” “Cassie, what do you think of this pink paisley?” “Cass, is this charcoal glen plaid the right weight for a newsboy?” For these men, this isn’t shopping. This is sport, a battle to see who will find the most memorable print. The suburban housewives shopping in Fabrique this morning are amused by this group of bow-tie clad men. The good-natured jabs come nonstop, and it’s obvious that the men have all become friends through this unusual form of male camaraderie. Most guys bond over sports, says gallery owner Bryan Embry, obsessing about box scores and stats the way these men do trim and lining. “We just prefer hats,” he says, shrugging. After an hour-long, hard-fought battle—“Keep your hands off my camel cashmere,” snaps Oak Cliff resident Kevin Johns—the fabric bolts are layed out on a cutting table, and the men place their orders. Newsboys are popular in Plano this trip. Samuels orders a gray wool newsboy with metallic purple lining and matching pocket square; Johns a cream cashmere one with Liberty print floral lining; Davis a gray wool newsboy and four pocket squares; Embry a cream/citron/black wool newsboy; and Shearer a gray and white striped cashmere newsboy with floral lining and three bow ties. MacGregor dutifully scribbles her notes and then, with a shooing motion, sends the gents two doors down to a neighborhood sports bar. While the guys compare style notes and debate fabric choices over pitchers of beer, MacGregor waits for the fabric to be cut. The bar regulars—their gimme baseball caps and jerseys a sharp contrast to the sartorial splendor they’re witnessing—sit in silence, a bit bewildered by the well-heeled scene playing before them. “Are you guys in a show?” one bar patron asks. “Nope, just getting drunk on a Saturday morning,” Samuels says. A beer-soaked roar of approval and a chorus of “hell yeah”s greet his reply, and the conversation quickly becomes a boisterous stew of fashion and football. MacGregor returns with her sack of fabric. The men pay their bar tabs. And everyone piles into the nondescript white van for the journey back to Dallas. Davis takes one last look at the Fabrique door as if he’s wondering what might have been with his puffy floral fabric of dubious design. Of course, there’s always next year.